This is a new, board-paged edition of the timeless favourite which will help children begin to understand about how to tell the time. 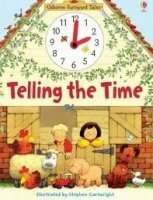 It follows a day in the life of the Boot family down on Apple Tree Farm, as Poppy and Sam learn to tell the time along with the reader. Each page shows a different activity, as well as the time it is being done, which the reader can then turn the hands on the toy clock to face. It features the charming illustrations of Stephen Cartwright. With a little yellow duck to find on each page, there is plenty to keep young children entertained.